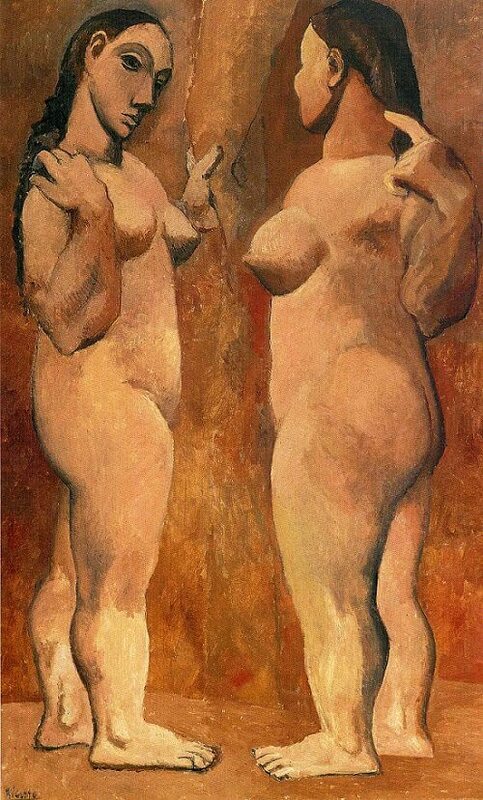 Picasso's Two Nudes precipitated a radical shift in his artistic practices. Though executed in the warm, pinkish tones of his rose period, the figures are now characterized by their sheer volume and weight, a striking contrast to the frail, emaciated and ethereal bodies of his earlier works. Where the previous figures seemed to float, these more sculptural figures stand foursguare. Picasso has added a sense of three-dimensionality to these figures. Yet the viewer also gains a sense of seeing them simultaneously from several viewpoints. For example, the torso of the right-hand figure is notably twisted and extended width-wise, so that we see both back and side views. The single breast, in particular - oddly positioned in the centre of the torso - undermines any sense of a single point of view. The facial features of the	left-hand figure also seem significantly depersonalized, derived as they are from the Iberian sculpted busts that Picasso had seen in the Louvre. Much of this solidity to the forms of his figures came from Picasso's increasing awareness of the works of Paul Cezanne, and particularly the older artist's late bather series.